I saw a recipe on a blog a week or so ago for King Ranch Casserole and it reminded me how much I like that casserole. Those of you not from Texas may not have ever heard of the King Ranch nor had the intense pleasure of eating this crazily good (and easy) casserole. It's such a simple and versatile mixture that you will want to keep it as a back pocket crowd pleaser. You know, one of those meals that you can whip up in a flash and makes everyone say what a fabulous cook you are. Oh yeah, you need to keep this recipe on file. 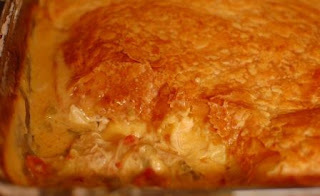 Traditionally, King Ranch Casserole is made with corn tortillas layered in between a slightly spicy chicken concoction. However, the chicken mixture can be made ahead and used in different formats. I had some puff pastry that was taking up valuable space in the freezer so decided that a King Ranch Pot Pie sounded awesome. I could have also used regular pie crust to make a top and bottom for the pot pie. Like all of my favorite recipes, this one is very forgiving to a dump cook like myself. Before you read this recipe, please know that I never said this was a low-fat option; but it is a tasty one. Saute veggies in butter until onions are transparent. Mix all ingredients together and pour into a 9x13 casserole pan. Roll out puff pastry on a floured surface. 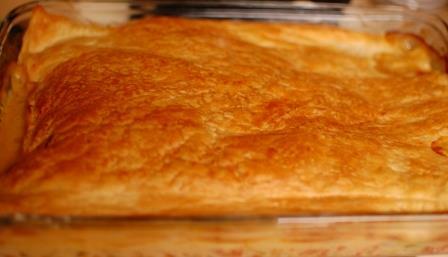 When big enough to cover the pan, gently lift the pastry off of your surface and place on top of the casserole. Cut a few slits in the top of the pastry. Stick it in the oven for about 30 minutes at 350F. This sounds awesome! I'm teriyaki chicken in the crock pot today but will hold onto this! You know you could put an italian slant on it with green peppers and marinara sauce, mozz cheese or a asian slant with ginger, soy and chili sauce. Casseroles are always so much fun! It is sooooo easy and tasty Ms. Katie; I'm sure it will be a family favorite for sure! I'm like you I forget how much I love this casserole, its a good one! Thank you so much for sharing your awesome recipe with Full Plate Thursday and have a great weekend.